American Samoa Community College (ASCC) Fine Arts Department Chairman Mr. Kuki Tuiasosopo reports that his student cast is ready to perform this semester’s theatrical production, the musical “Once On This Island,” with performances scheduled for Wednesday and Thursday, April 27 and 28, at 7:30 p.m. in the Lee Auditorium. Set in the French Antilles islands in the Caribbean, “Once On This Island” blends elements of the cultural, historical and supernatural to tell the story of a peasant girl who uses the power of love to bring together people of different social classes. Based on the 1985 novel “My Love, My Love or The Peasant Girl” by Rosa Guy, the story was translated into a musical play with a book and lyrics by Lynn Ahrens and music by Stephen Flaherty. The Broadway production opened in 1990, and since then the play has been revived numerous times in the United States and Europe. 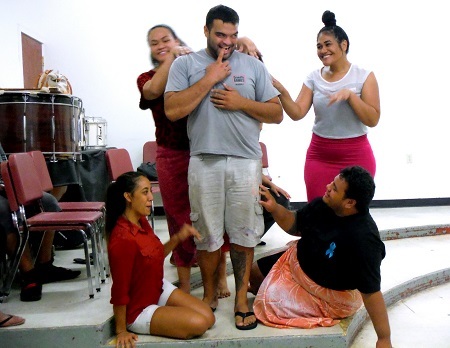 “Once On This Island” was even staged by ASCC back in June 2006, in a well-received production that helped pave the way for a run of even more elaborate plays over the next several semesters. 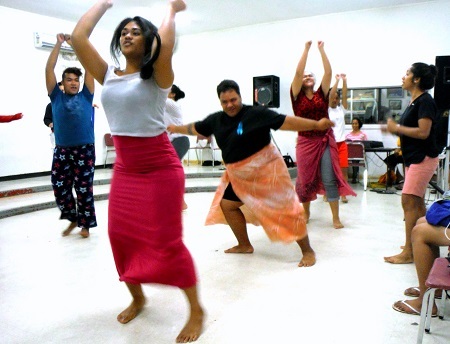 The cast for this year’s “Once On This Island” is Saniata Leota, Jocco Asotau, Alisa Ma’ae Sa’o, Steven Safotu, Ese Malala, Warren King, Ernie Flag Day Seiuli, Paulina Iuliano, Papeuli Tuiasosopo, Marietta Faatuuala, Maya Faiui, Naomi Galea’i, Quinnmere Fuimaono, Young Tuato’o, Tali Tauanu’u, John Pu’e, Ashley Isaako, Norman Mauga, Noeleen Betham, Anne Mendoza, Dezmond Applin, Philana Fiafia, Anasitasia Vaitele, and Eua Mata’utia. Ese Malala, who recently returned to ASCC after living and working in New Zealand and the United States for many years, has the distinction of having been in the cast of the 2006 production. This time, she not only has an onstage role, but also serves as Choreographer. “Ese has done a fabulous job,” said Artistic Director of Properties and Sets, Reggie Meredith-Fitiao. “We wanted to create visuals that would make us feel we are on a different kind of island than most of us are familiar with, one with a very Caribbean flair,” said Meredith-Fitiao, whose Design students have been busy putting together the production’s visual design. They even refreshed a 10 year old prop kept in storage from the 2006 staging. Color selection, from the backdrops to props to the costumes, has been carefully considered to create a visual extravaganza. 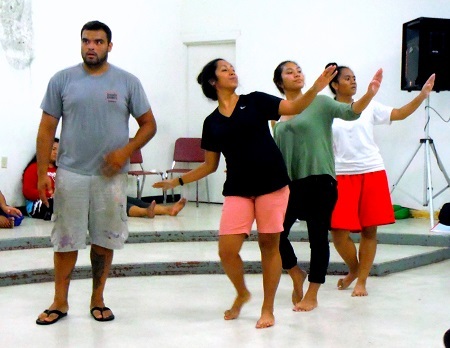 Student artists contributing to the set design are Liva Enele, George Tyron Young, Scottie Pene, Ray James, Pua Tofaeono, Jessica Casur, Rosie Soi, Isidro Balza, Emalie Laulau, Harginder Sall, David Faapouli, Hillary Purcell, Talaleei Loa, James Satila, Faafouina Fruean, and Taylor Kruse. In addition to the cast and artists, a student choir has been in rehearsal to contribute vocal support. 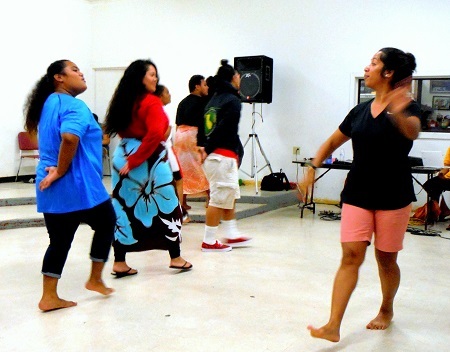 These singers include Vaiki Paau, Nathaniel Olo, Letumau Papalii, Tumanu Fesilafai, Lindalillian Taala, Kiana Lai, Jan Faauila, Manuel Iosefa, Aufata Faafoi, Slavation Togia’i, To’afitu Olomua, Christina Toilolo, Imeleta Luamanu, Genesis Lagai, Mark Tuisuga, Laufoe Atonio, Lipano Vele, Luckee Ta’ase, Ronhen Tui, Faau Levi, and Lologa Olo. For both evening’s performances, the Lee Auditorium will open its doors at 6 p.m. and the show will start at 7:30. Tickets will be available at the door or in advance at the ASCC Business Office public window during regular business hours.